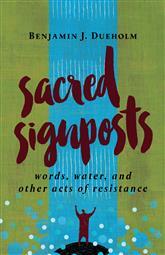 On June 27 at 7 p.m. I’ll be at Our Saviour’s Atonement Lutheran Church (178 Bennett Avenue, a short walk from the 1 and the A) to talk about Sacred Signposts: Words, Water, and Other Acts of Resistance. At the beginning of Lent, I invited the participants in our new member/baptism preparation groups to ask any question they had about church or faith, and I would try to answer them as best I could over the course of our meetings. I didn’t get to all of them in the six weeks we spend together, but a commitment is a commitment and I emailed the answers to everyone. It made for the kind of long, burdensome email I almost never write anymore. But they were big, important questions that, I realized, I often spend very little time answering.